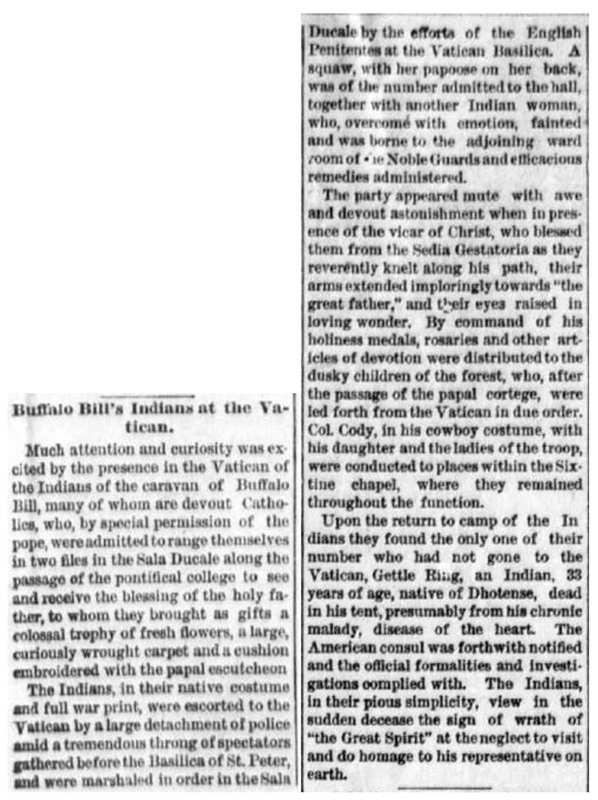 Buffalo Bill's Indians at the Vatican. Much attention and curiosity was excited by the presence in the Vatican of the Indians of the caravan of Buffalo Bill, many of whom are devout Catholics, who, by special permission of the pope, were admitted to range themselves in two files in the Sala Ducale along the passage of the pontifical college to see and receive the blessing of the holy father, to whom they brought as gifts a colossal trophy of fresh flowers, a large, curiously wrought carpet and a cushion embroidered with the papal escutcheon. The Indians, in their native costume and full war print, were escorted to the Vatican by a large detachment of police amid a tremendous throng of spectators gathered before the Basilica of St. Peter, and were marshaled in order in the Sala Ducale by the efforts of the English Penitentes at the Vatican Basilica. A squaw, with her papoose on her back, was of the number admitted to the hall, together with another Indian woman, who, overcome with emotion, fainted and was borne to the adjoining ward room of the Noble Guards and efficacious remedies administered. The party appeared mute with awe and devout astonishment when in presence of the vicar of Christ, who blessed them from the Sedia Gestatoria as they as they reverently knelt along his path, their arms extended imploringly towards "the great father," and their eyes raised in loving wonder. By command of his holiness medals, rosaries and other articles of devotion were distributed to the dusky children of the forest, who, after the passage of the papal cortege, were led forth from the Vatican in due order. Col. Cody, in his cowboy costume, with his daughter and the ladies of the troop, were conducted to places within the Sixtine chapel, where they remained throughout the function. 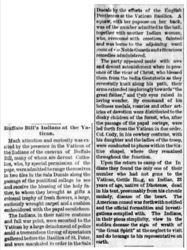 Upon the return to camp of the Indians they found the only one of their number who had not gone to the Vatican, Gettle Ring, an Indian, 33 years of age, native of Dhotense, dead in his tent, presumably from his chronic malady, disease of the heart. The American consul was forthwith notified and the official formalities and investigations complied with. The Indians, in their pious simplicity, view in the sudden decease the sign of wrath of "the Great Spirit" at the neglect to visit and do homage to his representative on earth.